These stained glass origami cranes of original design measure seven inches high and twelve inches across.They can be a hanging suncatcher or a table decoration. Blue usually signifies peace, white long life and good health and red is usually used for wedding decoration, because of their association with fidelity, prosperity and longevity. 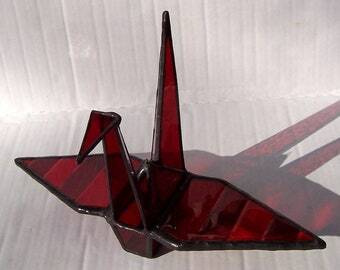 They are a perfect gift for babies or as a get well gift, as the crane is a symbol of long life. They area beautiful gift for weddings as the crane mates for life and are devoted in all seasons, sharing equally in nest building and caring for their young. They can also be a gift of happiness and peace to someone special. 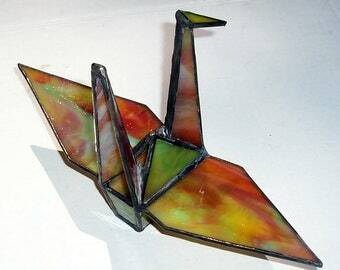 Throughout Asia the crane is a symbol of peace, happiness and eternal youth. It is said a thousand folded paper cranes makes a wish come true.
. A gift tag will be provided with each crane if you email me to let me know which you’d like :1.) This is our cry, This is our prayer, Peace in the world. 2.) Wishing you a quick recovery and a long and happy life. 3.) Wishing you a long and happy marriage and much prosperity. 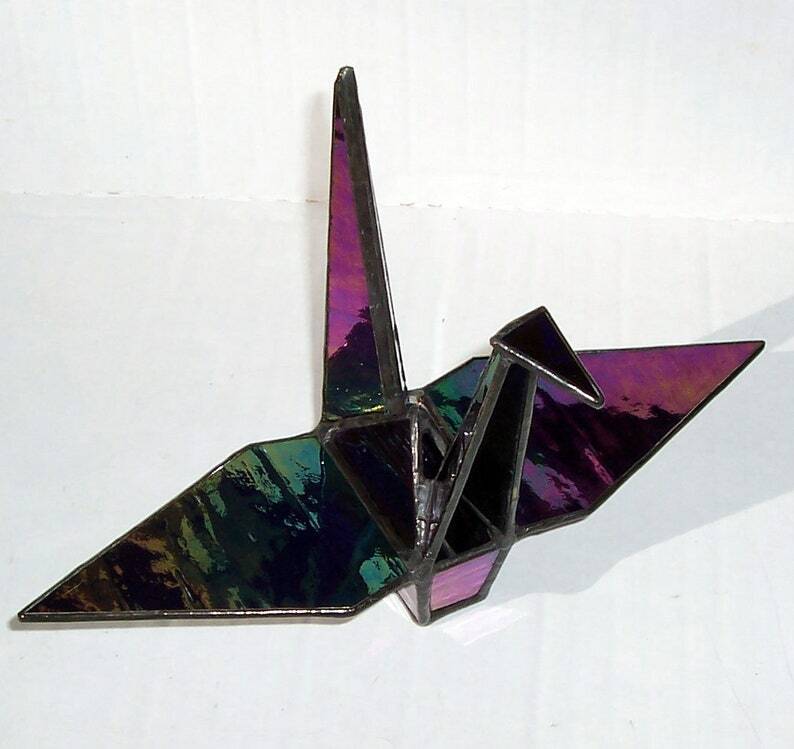 A pattern for folding a paper crane and a piece of origami paper, will be included with each purchase, perhaps you’d like to try to build one. on-water effect. Its intense rainbow-colored surface resembles oil on water. All images and content Copyright © Antoinette Rose of Suncatcher Creations™. All rights reserved by artist. Buyer is not purchasing rights to the pattern. Any and all reproduction rights are reserved solely by the artist. This image is not to be re-distributed, copied, imitated, or misappropriated in any way. If you are in any way unsure of the legal rights retained by the artist following the sale of the work, or are purchasing this artwork with the intention of re-selling this work you must be aware of the Visual Artists Rights Act.